Tesla finally unveiled its oft-delayed electric semi-truck Thursday night. 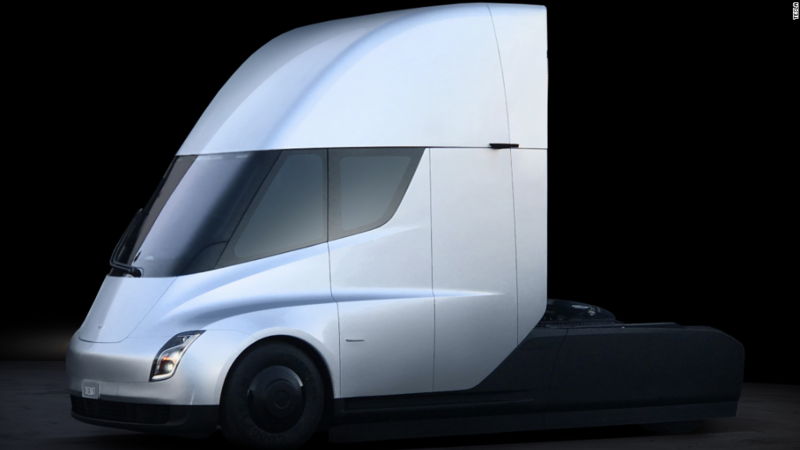 And even though production isn't expected to start on it until 2019, companies are already placing orders for Elon Musk's big rig. Walmart (WMT) told CNBC Friday that it has made orders for fifteen Semi trucks in the U.S, and Canada, with the hopes that it will help Walmart lower emissions and meet other sustainability goals. "We have a long history of testing new technology -- including alternative-fuel trucks -- and we are excited to be among the first to pilot this new heavy-duty electric vehicle," the company said to CNBC. Walmart was not available for comment and Tesla was not commenting on specific orders. Meijer, a Michigan-based supermarket chain, told Bloomberg at Thursday's event that it had placed orders for four trucks, putting down a $5,000 deposit for each one. The company said in a statement it had made a "small financial commitment" to test the new truck technology, "which has the potential to not only reduce our carbon footprint but also realize cost savings that will allow us to keep prices low for our customers." And J.B. Hunt Transport Services (JBHT), a top logistics and trucking company, said Friday it had made a reservation to buy "multiple" Tesla Semis. "Reserving Tesla trucks marks an important step in our efforts to implement industry-changing technology," said J.B. Hunt CEO John Roberts in a statement. Related: Does Tesla have enough cash to fix Model 3 production issues? Roberts added that the use of these trucks will be most beneficial for local routes and that J.B. Hunt planned to first deploy the Tesla Semi on the West Coast. That makes sense, according to Jerry Hirsch, editor at Trucks.com. Hirsch thinks Tesla may only get a small number of orders for the Semi from companies mostly looking to use them for short hauls -- about 20 to 250 miles -- from ports on the California coast to distribution centers in the inland part of the state. That's because there still appear to be limitations for how far the Semi can go before being charged. Musk boasted that the Semi will be able to go 500 miles at full speed before needing to stop to recharge the battery. But as CNNMoney's auto guru Peter Valdes-Dapena pointed out, diesel trucks can travel much further before needing to be refueled. And filling up the tank is a lot faster than charging a battery. Hirsch agrees. "The Tesla Semi is not for long haul trucking," he said. Still, the Semi is likely to make some waves in the industry. Hirsch said that the decision to have the driver sit in the center of the truck will improve the aerodynamics of the vehicle and that other truck manufacturers may follow suit. "Everybody in the trucking industry is going to look at this," Hirsch said. "This is going to spark a change among other manufacturers, radical changes that have been previously resisted." But Hirsch is still not certain that the Semi will wind up being a huge generator of sales (or profits) anytime soon for Tesla. For one, it's unclear if Tesla will actually get the Semi rolling out by 2019 as promised. Musk is notorious for making overly lofty promises and missing deadlines. Tesla also has a lot on its plate right now with trying to deliver its new Model 3 to customers in a timely fashion. The "cheaper" Model 3 is what many on Wall Street hope will vault Tesla into the upper echelon of mass market auto makers. Tesla is currently more of a niche, luxury car company, selling the high-end Model S sedan and Model X crossover. Wall Street seems to be buying into the Tesla (TSLA) hype though. Shares rose Friday and they are up almost 50% so far this year. The surprise introduction of a new version of Tesla's beloved Roadster sports car also helped push the stock higher. But Tesla has pulled back recently due to concerns about Model 3 production and integration issues with Tesla's acquisition of solar panel company SolarCity -- a firm co-founded by two of Musk's cousins. Tesla shares are about 20% below their record high. And Hirsch thinks that tough competition could be a problem for Tesla too. The company is not alone in trying to reinvent the trucking industry and make it more green. He noted that engine maker Cummins (CMI), German auto giant Daimler (DDAIF) and commercial truck company Navistar (NAV) are all working on their own electric trucks. Toyota (TM) is testing a hydrogen fuel cell truck as well. And so is a startup called Nikola Motor, which just so happens to be the first name of the famed inventor that Tesla is named after. All this competition could become a problem if Tesla can't live up to its production goals. "Tesla never gets things done in the time frame they say they will," Hirsch said. "There may not be meaningful distribution of this vehicle for at least three years."